You are here: Home / Blog / Happy 94th Birthday, Fred Beckey! Happy 94th Birthday, Fred Beckey! Living legend Fred Beckey turns 94 today. Join us in wishing the original "dirtbag climber" a very happy birthday. Fred Beckey's likeness created by Nikki Frumkin. Fred Beckey, a living legend among Northwest Mountaineers, is a climber, environmentalist, historian, and author. He is recognized as one the most imaginative, persistent, and thorough explorer and mountain investigator of the Cascade Range Wilderness. He's also noted as “one of America’s most colorful and eccentric mountaineers,” and is unofficially recognized as the all-time world-record holder for the number of first ascents credited to one man. Fred was born in the suburbs of Dusseldorf, Germany in 1923. Times were hard, if not desperate, and his father, Kalus, a physician and surgeon, and his mother, Marta Maria, an opera singer, decided to immigrate to Seattle in 1925. As a boy he hungered for something that would engage his mind and make Herculean demands of his body. He started climbing in the Boy Scouts and continued as a teenager with The Mountaineers graduating from the Basic climbing course. 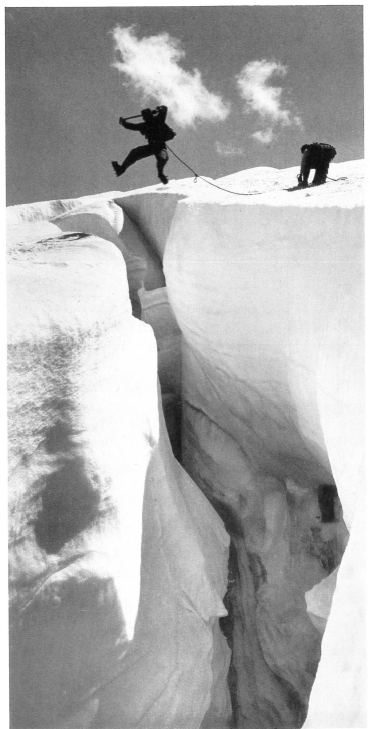 In 1939, Fred made his very first, first ascent, with Lloyd Anderson and Clint Kelley; they climbed Mt. Despair in the North Cascades. In 1942, Fred and his brother Helmy rocked the climbing world when they made the second ascent of Mt. Waddington, one of British Columbia's highest peaks with 7,000 feet of vertical rock and ice. He was 19 years old at the time. Over the course of seven decades, Fred would amass more first ascents than anyone else on earth and author books that are considered classics of mountaineering literature. Fred invented the climbing life and for over 70 years showed us how to live it, and is credited with being the original "dirtbag climber". We are grateful to his contributions to our community. Happy Birthday Fred! 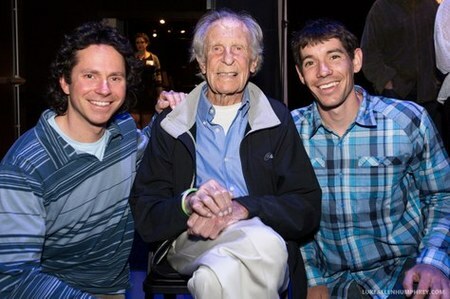 TWO YEARS AGO YEAR WE CELEBRATED FRED AS THE RECIPIENT THE OF 2015 MOUNTAINEERS LIFETIME ACHIEVEMENT AWARD AT OUR BREAKTHROUGH DINNER AND AUCTION FEATURING FRED, COLIN HALEY, MIKE GAUTHIER, AND ALEX HONNOLD. Beckey is featured prominently in my one of my favorite books, The Mountaineers: A History, published by Mountaineers Books. Here's an exerpt by Jim Kjedleson. unparalleled good fortune. Only the highest Northwest peaks had been climbed, and all a young climber had to do to score a first ascent was head for the nearest blank spot on the map. Many of the mountains hadn’t even been surveyed, and the climbers often went without benefit of a map. Often they explored the area first and returned later, relying on their own notes to reach the summit. In 1939, Lloyd Anderson, with Clinton Kelley and Jim Crooks, made the first ascent of Sinister Peak, near Dome Peak. Anderson, with Kelley and fifteen year-old Fred Beckey, were the first climbers to the summit of Mount Despair. ascents, was nineteen at the time. His younger brother had just turned seventeen. Beginning with this startling assault on Mount Waddington at such a young age, Fred Beckey’s climbing exploits would become the stuff of legend. His unblinking focus on the summit became something of a Beckey trademark. His pace and commitment were unrivaled. Many mountaineers considered it an honor to climb with him, but a number could not find the energy or time to be involved in more than a few of his ascents. Fred and Helmy insist, is the toughest one they have ever climbed. “From a platform as big as a table, a three-man shoulder stand had to be used to get Fred over the 12-foot overhang onto a 10-foot slab that wasn’t more than 70 degrees but had no holds or piton cracks. because no real technique was involved. But from this point on it became almost a matter of pride to list the techniques employed, especially in accounts by Fred Beckey. living out of the trunk of his car as he drove around the country in a quest for new climbs and new partners. Many climbers have followed Beckey’s inspiration over the years, embracing this nomadic lifestyle for the sake of climbing. Aside from his climbs, Beckey’s crowning achievement has been his three-volume Cascade Alpine Guide, now published by Mountaineers Books, which evolved out of his earlier book, the Climber’s Guide to the Cascade and Olympic Mountains of Washington. The Cascade Alpine Guide remains indispensable for anyone climbing in the Cascades. Fred has inspired and mentored countless young climbers through his determination and never ending quest for new routes and exploration of the mountain world. We owe him a a debt of gratitude for his influence.